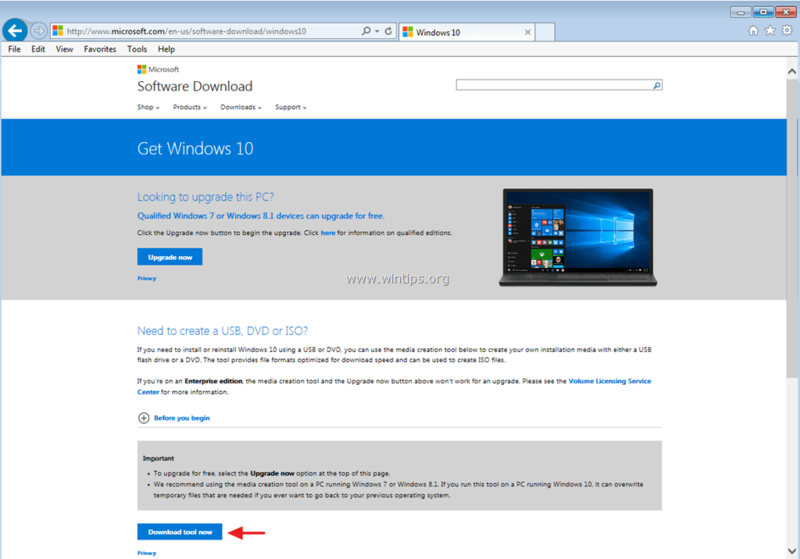 This tutorial contains detailed instructions on how to download Windows 10 legally from Microsoft's website in order to create a Windows 10 USB installation media for installation or repair purposes by using Microsoft's media creation tool. 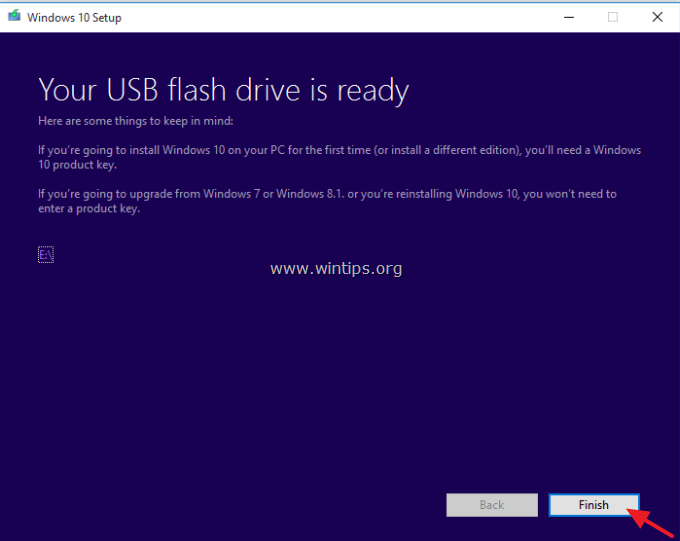 How to create a Windows 10 USB installation disk. 1. Navigate to Get Windows 10 Download site & choose the Download tool now link. Step 2. 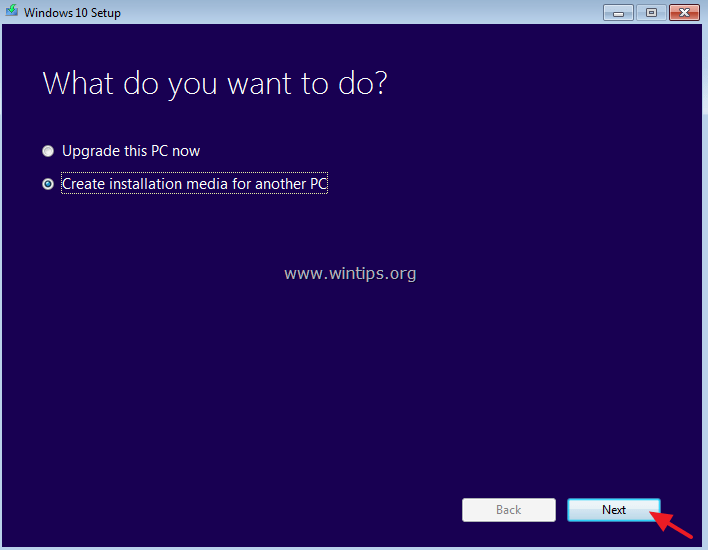 Use Media Creation Tool to Download Windows 10 installation files. If you want to install Windows 10 on the current PC, leave the Use the recommended options for this PC box checked. At this case the Media Creation Tool will create an installation disk with the same language, edition, and architecture as the current PC. If you want to install Windows 10 on a different PC, language, language, edition,architecture, uncheck the Use the recommended options for this PC box and then choose the Windows 10 language, edition, and architecture that you want to download. If you choose Windows 10 as selected edition then you "ll able to install both the Home and Pro edition (according to your product key). 5. To create a bootable Windows 10 USB installation media select USB flash drive and plug an empty USB stick (at least 4GB) on the computer. Click Next to continue. By selecting ISO file, you will be able to store Windows 10 on your computer in a ISO file for later usage or to burn a bootable Windows 10 DVD after (Windows 10 ISO) download is completed. If you want to create a Windows 10 DVD installation media select ISO file and then follow the instructions on this post: How to Download Windows 10 ISO & create a bootable Windows 10 DVD installation media. 6. Review your selections and press Next. 7. Wait the MCT to download and transfer Windows 10 files to the USB disk. 8. Finally click Finish. Your Windows 10 USB disk is ready for use. « How to Fix Network Adapter Code 31 error (Device is not working properly). » How to burn (transfer) a Windows 10 ISO file to a USB disk, using RUFUS utility.